First - I want to state that it is much easier to stop blogging than to start again! No photo for this next part - I hope your imagination is working well! I have just had cataracts taken off both eyes. This is day surgery and you are given what they call a twilight anaesthetic- which means that you are awake all the time but don't feel any pain. When I came out from the operating theater I was lying flat on a bed/trolley and swathed or cocooned in a warm fluffy brown blanket with just my head poking out. As others also came out they were the same way. I felt like a brown moth and wished I could draw everyone all lined up this way. As soon as possible we were sat up in an easy chair and given a cup of tea or coffee and something to eat. By the way - my eyes are much improved and my sight is so much better. I just wish there were something similar that could be done for the macular degeneration! My eye specialist is down on the Sunshine Coast - about an hour and a half drive away. By the time we got home it was nearly dark but there to welcome us were at least a dozen White Cockatoos swinging on the electricity wires at the gate and all yelling in typical "cockie" fashion. No photos taken right then but here are a couple of photos taken a while ago when the birds were putting on a similar show in my back yard. Now it is just a matter of keeping up blogging!! nice to see you back. I recognize that insect cocoon, think we have them here sometimes. Glad to have you back ~ and that first photo is amazing as well as the cockatoos which you well deserved to welcome you home ~ enjoy some time for self but hope you keep blogging! Such lovely shots! That moth really is something. Welcome back Mick. Yes, there are some strange creatures around when we begin to lookinto the nooks and crannies of bugs and bites. Look forward to reading more of your adventures. Welcome back Mick. I am so glad your eye surgery went well. Wow, what a strange looking moth. 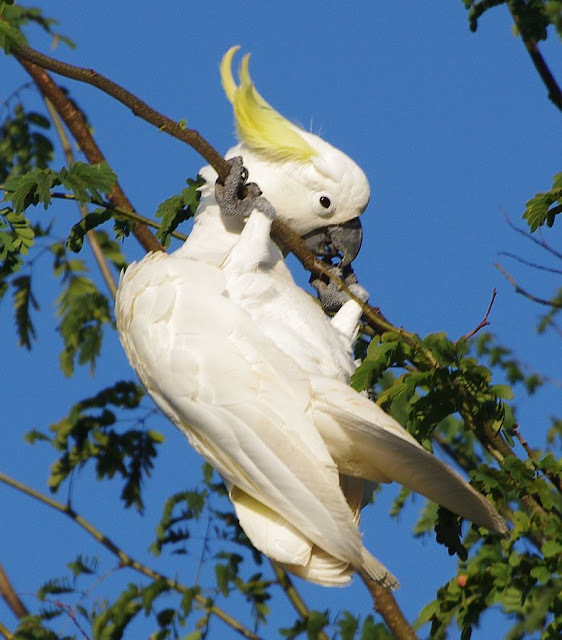 I love the beautiful cockatoos. They are a wonderful sight to see in the wild. Have a great day and week ahead. So glad to see you here! That moth is crazy looking! 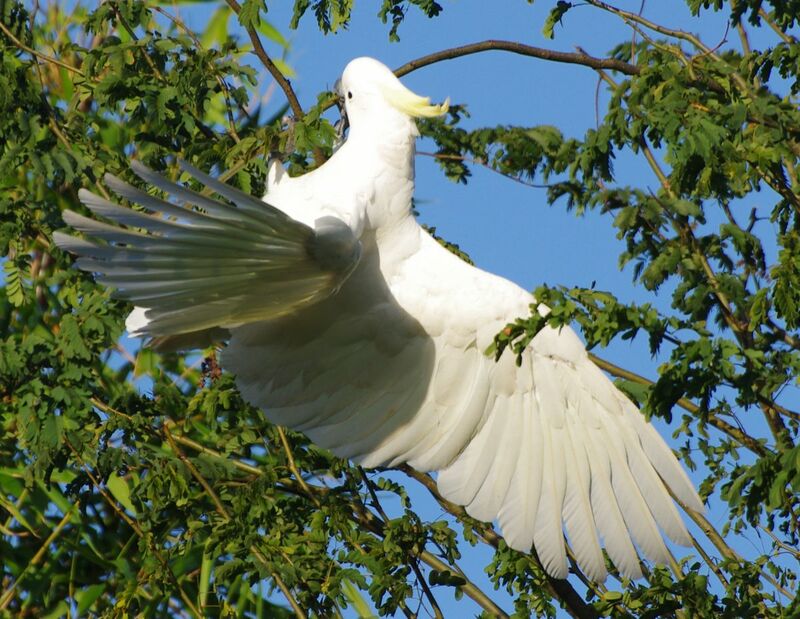 Amazing for you to be welcomed home by those beautiful cockatoos. ... I know they aren’t as exotic to you as to me, but they still must have brought a huge smile! So glad your eye surgery went well. I watched Bill’s through a viewing window...that was harder on me than having my own done, because I went clear out, even tho they said I would be awake. Good to see you back. It looks more like a squid than a moth. Welcome back! I remember finding one of these cases in our garden - and having no idea what it was at the time. Glad to hear that some parts of your eye issues have been sorted. Don't forget that Wild Bird Wednesday still happens!! Cheers - Stewart M - Melbourne. I am really happy to hear that your surgery went well. When my nephew was tiny, he loved being wrapped really tight to sleep, no matter how hot it was! I love your cockatoos! We have wild ones here in New Zealand, but they don't come close to houses. I've only seen them in treetops along very rural roads.